This Crock Pot Pineapple Pork Burrito Bowl recipe is so easy to make in a slow cooker and delicious, too! You’ll love how fragrant your house becomes as this gluten-free and dairy-free recipe turns into the most tender pork! Me and my Crock-Pot are attached at the hip. It’s my go-to for quick meals that don’t take a lot of effort and are full of flavor. I love throwing a few ingredients in the slow cooker on lazy Sundays or before work and coming home to a delicious smelling dinner. It also has been great during the summer when I don’t want to turn the oven on in our small apartment in Chicago because that only makes it hotter in here. During the fall I just love the smell of whatever is cooking in the Crock Pot while I relax watching football with the porch door open on a cool day. Today, I’m loving it for the fact that I want to make some cookies in my oven and having my dinner going in the Crock-Pot frees that up for me. Whatever your reason, Crock Pots are a dream when it comes to meal prep. 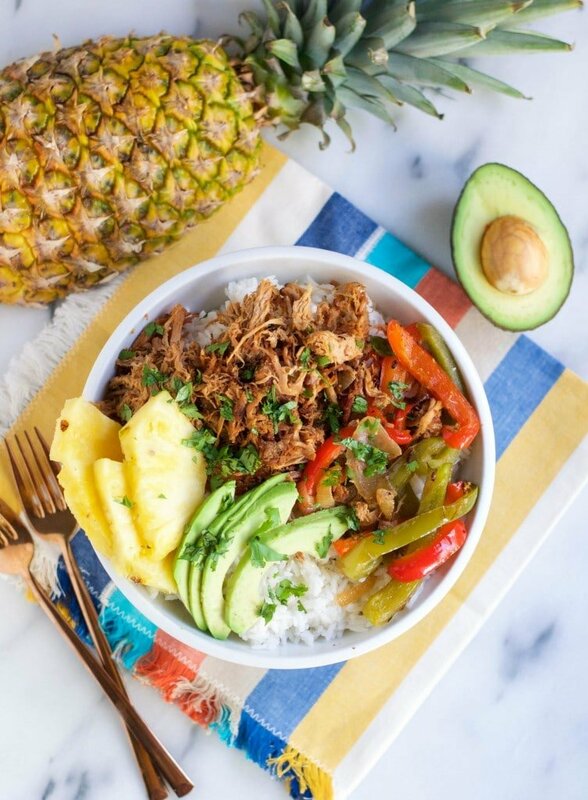 This Crock Pot pineapple pork burrito bowl recipes is no exception. The pork is easy to cook up in the slow cooker and you can gradually eat it during the week. I’ve already posted a similar recipe with my slow cooker pineapple pork lettuce wraps earlier this summer. I’ve changed up the recipe a bit here and added a burrito bowl spin on it. 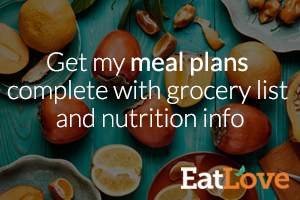 It does take some preparation outside of the Crock Pot but mostly just cooking rice and some chopping of fruits or vegetables. Easy peasy right? I also just love how pretty this meal is. We eat with our eyes and I truly think that the more colors you have on your plate, the happier you’ll be eating your meal. Better yet, the colorful ingredients tend to be the healthy vegetables anyways. Win win! There are so many reasons I love this recipe. The pork itself is so good – a little sweet, yet garlicky and smokey from the bacon. Bacon makes everything better, for real. The pineapple chunks on top bring out more of the sweetness in the pork and adds a nice fresh element to the bowl. I love the added veggies for flavor and avocado just brings this perfect creaminess that I find to be a great addition (and I’ll legit eat avocados on anything as you already know!) – I hope you all enjoy this recipe as much as I did. It’s been a meal prep staple in my house this summer! This Crock Pot Pineapple Pork Burrito Bowl recipe is so easy to make in a slow cooker and delicious, too! You'll love how fragrant your house becomes as this gluten-free and dairy-free recipe turns into the most tender pork! Place bacon in the bottom of the crock pot. Then, set the pork roast on top of the bacon. Pour the pineapple chunks, garlic, salt and pepper over the pork. Stir to combine. Cook on low for about 6-8 hours or on high for 4-5 hours, until the pork is tender. Spoon pineapple and juice over the pork midway through. Shred the pork with a fork, mix with the pineapples and let cook for an additional 10-15 minutes. While the pork is cooking, add rice and broth to a small pot. Bring to a boil. Once boiling, cover with a lid and lower heat to simmer. Let cook for 15-20 minutes (if using short grain white rice) or until water has evaporated and rice is cooked through. Fluff with a fork and set aside. Saute onions and bell peppers with the olive oil in a large skillet over medium heat for 7-10 minutes, until they are tender. To assemble, place rice in a bowl. Top with pulled pork and add sauteed vegetables, sliced avocado, and pineapple and sprinkle with fresh cilantro.